You are currently browsing the archive for the Richmond category. Pork belly and boneless short ribs at Claypot Hot Pot and BBQ. Photo by David Lansing. I don’t understand people who go to an Italian joint and complain about the tenderloin they ordered. Or go to a steakhouse and complain about the scampi. You have to know what the restaurant you’re dining at does well. And usually it’s not too difficult if you look at the menu. For instance, at Claypot Hot Pot and BBQ, a Cantonese-style all-you-can-eat hot pot joint, there are like 20 meat items versus 8 seafood items (assuming a fish head is seafood). So why do so many people complain about the oysters being too small or the prawns not tasting fresh enough? 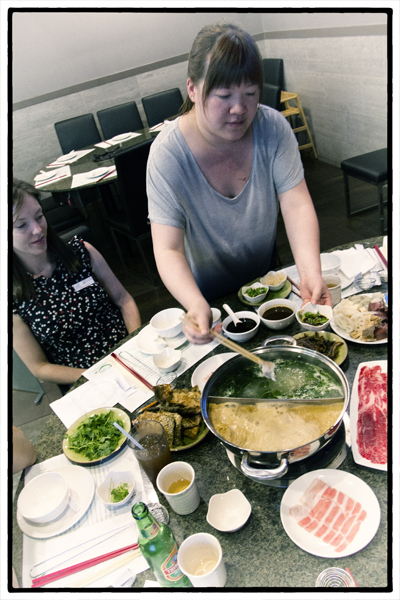 Question: Who the hell orders oysters at an AYCE hot pot restaurant? Would you order oysters at KFC? You want great oysters, go to a seafood restaurant on the docks. You want cheap food, go to Claypot and order the sliced boneless short ribs. And the sliced lamb shoulder. And the pork belly. And then order the spicy Szechuan soup stock, which has a nice kick to it, and then dip your short ribs in the stock for a minute or two, give it a good dunking in one of the side sauces, and enjoy. Better yet: Order the spicy Szechuan soup stock and the hearty free-range chicken broth, and they’ll put them 50-50 in one pot. That’s what we did. And it was killer. Just don’t order the oysters. 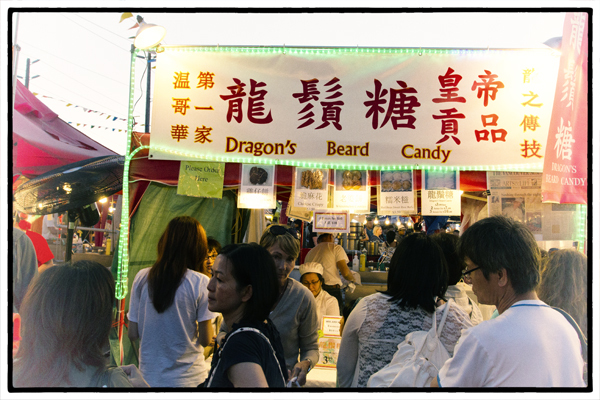 The dragon’s beard candy stall at Richmond’s night market. Photos by David Lansing. So Mijune and I were gobbling up some serious crispy skin pork from Parker Place Meat & BBQ when Mijune spotted a place where they sell dragon’s beard candy. She bought a little four-pack of the stuff and I tried it. It was okay. Not great, but okay. And then a few days later, we were at T&T, the Asian supermarket, and, again, we got some dragon’s beard candy. I liked it better this time. So last weekend when we were pigging out at the Richmond Night Market, our last stop was the Kam’s Dragon’s Beard Candy stall. Dragon’s beard candy is sort of like Chinese cotton candy—with a peanut cluster in the middle. What makes it interesting isn’t so much what it tastes like but how it’s made (and I think you could say the same about cotton candy). 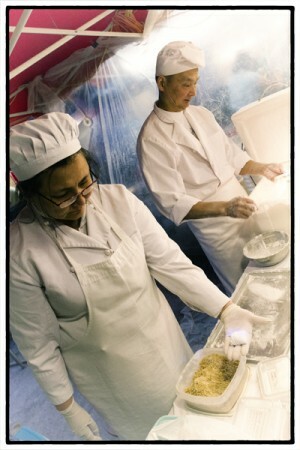 She’s holding a piece of dragon’s beard candy while the guy on the right is doing his magic making the sugar strands. Photo by David Lansing. I stood watching the guy making the candy at the Night Market and Mijune tried to explain to me what was going on. Basically, the guy takes spun sugar that has been boiled and then repeatedly pulls and folds it over until he’s created hundreds of thread-like sugar strands, and then he covers the sugar strands in rice flour, to prevent sticking, while pulling the strands apart. Once the strands are made, he hands them to a woman who cuts them into small pieces and wraps the spun sugar around a mixture of peanuts, sesame seeds, and coconut. That’s it. Originally, Dragon’s beard candy was only made for the emperors of China (and called dragon’s beard because dragons are a Chinese imperial symbol). According to Mijune there are only a few hundred people in the world today who even know how to make it. So I suppose that also adds to its allure. Also, it doesn’t really hold up very well after its made. You kind of need to eat it fresh. Which also makes it seem more exotic. Anyway, we waited in line for 15 or 20 minutes, watching the guy pull the sugar strands apart and it was like watching a magic trick. I couldn’t quite figure out how, exactly, he did it. I asked the woman who was taking the sugar strands and stuffing them with the nut/coconut mixture how long it took the guy to learn how to make the candy. She said four years. So it takes him four years to learn how to make the candy, and then we have to stand in line for 15 minutes to buy a package, and the whole thing is gone in like 30 seconds. The short, happy life of dragon’s beard candy. The dish with the egg on top is the dol sot bee bim bahb. Photo by David Lansing. It takes me just about five minutes to walk from my hotel to Alexandra Road in Richmond. This is great because Alexandra Road is known as Richmond’s “Food Street.” They say that around a three-block radius of Alexandra Road are well over 200 Asian restaurants. So I walk beneath the Aberdeen Centre Canada Line station, up No. 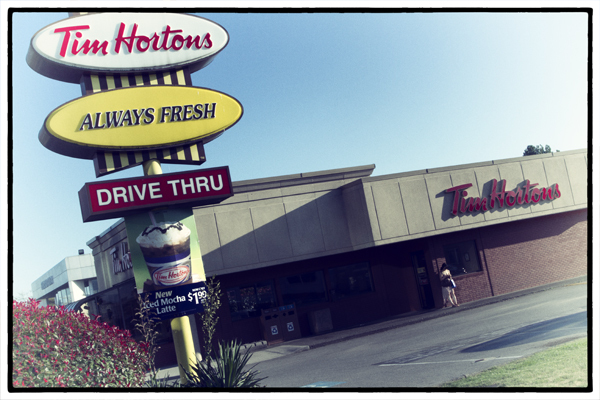 3 Road past the Parker Place Mall, and then hang a left at Alexandra and I’m on Food Street. And it is. A food street. 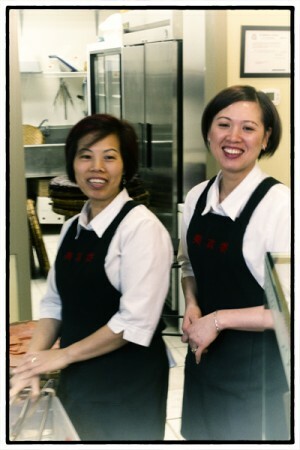 There’s are Vietnamese pho shops and Thai noodle places and Hong Kong bubble tea cafes and Shanghai dumpling joints. But tonight I’m headed for Jang Mo Jib, a well known Korean restaurant. I’m having dinner with Stacey Chyau who really knows the food scene around Alexandra Road. Stacey was born in Taiwan and moved to Canada a little over 20 years ago. 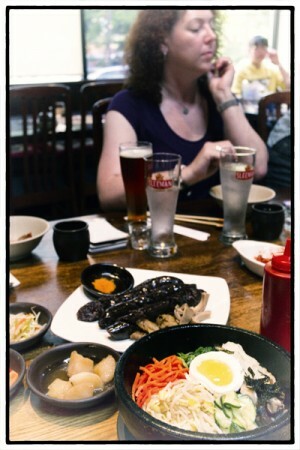 The good thing about dining with someone like Stacey is that you can let them do the ordering. Jang Mo Jib is an interesting place. It was a Japanese restaurant and lounge before the Moon family turned it into a Korean claypot and bbq place in 2005. But the building itself, to me, looks like a Swiss chalet. 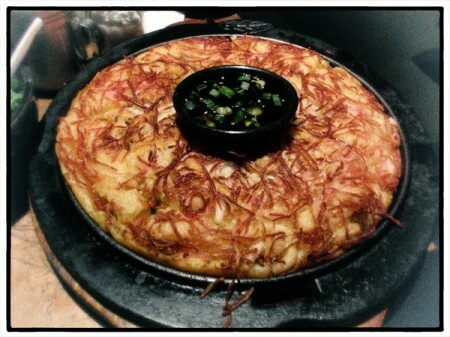 The seafood pancake at Jang Mo Jib Korean Restaurant. The first thing Stacey wanted me to try was the hae mool pah jun which the menu says is “assorted seafood pancake.” Well, it was round like a pancake but to me it looked more like crispy hash browns. Stacey sliced it into wedges and spooned on a little soy sauce with chopped scallions. Fabulous. We also got the gam ja tahng—pork back and neck bones served in a hot pot with green onion, vegetables, and potatoes in a broth—but the main attraction for me was the hot pot with an assortment of beef, preserved vegetables, sautéed kimchi, and a fried egg on top called dol sot bee bim bahb. It was tasty but it was also quite beautiful. So much so that neither Stacey or I wanted to break the egg on top and ruin the composition of the dish. But we did.